Protologue: Bull. Misc. Inform. Kew 1934(5): 184 (1934). Berlinia confusa occurs from Sierra Leone east to Cameroon and south to Gabon. The wood, often traded with other Berlinia spp. as ‘ebiara’, ‘berlinia’ or ‘melegba’, is used for construction, flooring, interior trim, joinery, ship building, vehicle bodies, canoes, furniture, cabinet making, mortars, agricultural implements, precision equipment and turnery. It is suitable for railway sleepers, draining boards, veneer and plywood. 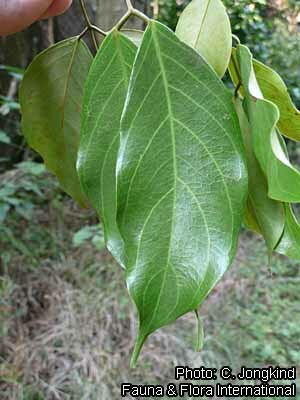 In Sierra Leone leaves are used in sauce preparation, and fruits for making soap. In Liberia bark sap is applied in traditional medicine as ear drops, and the seeds are used as bait for rodents. In Côte d’Ivoire leaf preparations are administered to promote childbirth and to improve blood circulation, and as tonic, and in Ghana to treat intestinal complaints and as an enema to treat constipation. 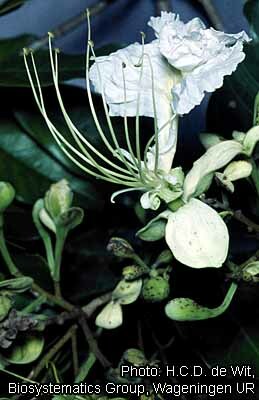 Berlinia confusa is sometimes planted as a shade tree in coffee plantations. In Gabon the export of ‘ebiara’ timber (Berlinia spp.) as logs increased from 200 m³ in 1991 to 6400 m³ in 1999 and to 12,200 m³ in 2005. In Cameroon the export was 500 m³ in 1998, but only 15 m³ in 1999. The wood of Berlinia confusa and other Berlinia spp. is currently traded in small amounts only on the international market. The heartwood is reddish brown, and distinctly demarcated from the wide, whitish to greyish sapwood. The grain is usually interlocked, texture rather coarse. The wood is medium-weight with a density of 690–720 kg/m³ at 12% moisture content. It air dries slowly, but usually with little degrade. The rates of shrinkage are high, from green to oven dry about 4.5% radial and 9.7% tangential. At 12% moisture content, the modulus of rupture is 105–150 N/mm², modulus of elasticity 10,780–11,760 N/mm², compression parallel to grain 53–55 N/mm², shear 9–15 N/mm², cleavage 18–20 N/mm, Janka side hardness 6050 N and Chalais-Meudon side hardness 3.5. The wood is moderately easy to saw and work, but has a tendency to split. It can be polished to a good finish, but picking up of interlocked grain may occur in planing, which should be done with care. The wood has moderate nailing properties. The slicing and peeling properties are satisfactory, as well as the gluing properties. The wood is moderately durable, being susceptible to pinhole borer and marine borer attacks, but slightly resistant to termite attack. The heartwood is moderately resistant to preservative treatment, but the sapwood is permeable. The wood is liable to staining in contact with iron. Leaf extracts contain saponins, tannins, anthraquinones and glycosides. The wood of Berlinia confusa is often mixed with that of other Berlinia spp. 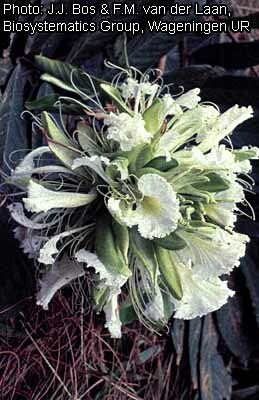 with similar properties and uses, especially Berlinia bracteosa Benth. Evergreen medium-sized to fairly large tree up to 35(–40) m tall; bole branchless for up to 25 m, often irregular, sometimes straight and cylindrical, up to 100 cm in diameter, often with low buttresses, sometimes fluted at base; bark surface smooth to scaly, pale grey to yellowish brown, inner bark fibrous, yellowish to pale pinkish brown, slightly sticky, strongly scented; crown obconical, dense; twigs whitish to greyish, glabrous. Leaves alternate, paripinnately compound with 3–5 pairs of leaflets; stipules large, caducous; petiole 1.5–5 cm long, rachis up to 15 cm long; petiolules 0.5–1 cm long; leaflets opposite or nearly so, ovate-elliptical to obovate, asymmetrical, 5–15(–17) cm × 2.5–7(–9) cm, rounded to cuneate at base, acute to acuminate at apex, papery to thin-leathery, minutely hairy below, pinnately veined with 4–9 pairs of lateral veins. Inflorescence an axillary or terminal few-branched panicle or raceme up to 16 cm long, densely reddish brown short-hairy, many-flowered; bracts small, caducous. Flowers bisexual, zygomorphic, 5-merous, scented, with 2 bracteoles up to 3.5(–4.5) cm × 1.5 cm at base; pedicel 1.5–3 cm long; hypanthium up to 1.5 cm long, usually glabrous; sepals linear, c. 1.5 cm long; petals free, 1 large, 4–6 cm long, with long claw at base, slightly notched at apex, other 4 c. 1.5 cm long, white; stamens 10, 5–6.5 cm long, 9 fused at base, 1 free; ovary superior, stiped, densely short-hairy, style slender, about as long as stamens. Fruit a large, woody, oblong, flattened pod up to 35 cm × 11 cm, with short stipe, glabrous, dull brownish to black, with indistinct diagonal veins, dehiscing with 2 valves, c. 4-seeded. Seeds flat, rounded to ellipsoid, up to 5 cm in diameter, brown. Seedling with epigeal germination; hypocotyl very short, epicotyl 15–30 cm long; cotyledons thick, spreading just above ground level. Berlinia comprises about 20 species and is confined to tropical Africa with nearly all species occurring in West and Central Africa. Many species closely resemble each other, and identification may be problematic. Berlinia confusa belongs to section Berlinia, characterized by petals that are very unequal in length and small bracts. It has been confused with several other species from this section, especially Berlinia auriculata Benth., Berlinia congolensis (Baker f.) Keay, Berlinia coriacea Keay and Berlinia grandiflora (J.Vahl) Hutch. & Dalziel. The wood of all these species, and probably some other, is mixed in trade. Berlinia auriculata Benth. is a shrub or small to medium-sized tree up to 20(–30) m tall, with a bole diameter up to 75 cm. It is found in Nigeria, Cameroon, Gabon and Congo. Its wood is probably used for similar purposes as that of Berlinia confusa. Berlinia congolensis (Baker f.) Keay is a small to medium-sized tree up to 20(–30) m tall, with a bole diameter up to 65(–120) cm. It is found in Nigeria, Cameroon, Equatorial Guinea, Gabon, Congo, DR Congo and northern Angola. Its reddish brown wood can be used for similar purposes as that of Berlinia confusa, especially for joinery, furniture, vehicle bodies, railway sleepers, veneer and plywood. The wood is medium-weight with a density of 620–710 kg/m³ at 12% moisture content. In Congo the bark is used in traditional medicine to treat skin complaints. Berlinia coriacea Keay is a small to medium-sized tree up to 25 m tall, with a bole diameter up to 30 cm. It is confined to Nigeria and Cameroon. Its wood is probably used for similar purposes as that of Berlinia confusa, and Berlinia coriacea may have value as an ornamental tree. Berlinia craibiana Baker f. is a shrub or small to medium-sized tree up to 30(–40) m tall, with a bole diameter up to 40(–80) cm. It is found in Nigeria, Cameroon and Gabon. Its wood is probably used for similar purposes as that of Berlinia confusa. Berlinia giorgii De Wild. is a small tree up to 15(–20) m tall, with a bole diameter up to 50 cm, occurring in DR Congo, Burundi, Zambia and Angola. The wood is occasionally used, e.g. to make drums. Berlinia viridicans Baker f. is a small tree up to 10 m tall, occurring in Gabon, Congo, south-western DR Congo and Cabinda (Angola). The wood, with a density of about 670 kg/m³ at 12% moisture content, is similar to that of Berlinia confusa and used for similar purposes. Growth rings: 1: growth ring boundaries distinct; 2: growth ring boundaries indistinct or absent. Vessels: 5: wood diffuse-porous; 13: simple perforation plates; 22: intervessel pits alternate; 23: shape of alternate pits polygonal; 26: intervessel pits medium (7–10 μm); 27: intervessel pits large (≥ 10 μm); 29: vestured pits; 30: vessel-ray pits with distinct borders; similar to intervessel pits in size and shape throughout the ray cell; 42: mean tangential diameter of vessel lumina 100–200 μm; 43: mean tangential diameter of vessel lumina ≥ 200 μm; 46: ≤ 5 vessels per square millimetre; 47: 5–20 vessels per square millimetre; 58: gums and other deposits in heartwood vessels. Tracheids and fibres: 61: fibres with simple to minutely bordered pits; 66: non-septate fibres present; 69: fibres thin- to thick-walled. Axial parenchyma: 80: axial parenchyma aliform; 81: axial parenchyma lozenge-aliform; (82: axial parenchyma winged-aliform); 83: axial parenchyma confluent; 89: axial parenchyma in marginal or in seemingly marginal bands; (91: two cells per parenchyma strand); 92: four (3–4) cells per parenchyma strand; (93: eight (5–8) cells per parenchyma strand). Rays: (96: rays exclusively uniseriate); 97: ray width 1–3 cells; (104: all ray cells procumbent); 106: body ray cells procumbent with one row of upright and/or square marginal cells; 115: 4–12 rays per mm. Secretory elements and cambial variants: (131: intercellular canals of traumatic origin). Mineral inclusions: 136: prismatic crystals present; 142: prismatic crystals in chambered axial parenchyma cells; (143: prismatic crystals in fibres). In a sample plot in Sierra Leone, the mean annual diameter increment of trees with a bole diameter of about 30 cm was only 2 mm. In West Africa old leaves often fall around November, followed by new flushes of leaves about one week later. The young leaves are initially orange-red, changing to purplish and then pale green. In Sierra Leone and Ghana flowering trees have been mainly recorded in March–May, in Liberia and Côte d’Ivoire in January–April; ripe fruits are found in Liberia in July–September, in Côte d’Ivoire in February and August–September, in Ghana in September–December. Fruits open explosively, scattering the seeds over some distance. Berlinia confusa occurs in a variety of lowland forest types, from wet evergreen forest to dry semideciduous forest, including secondary forest. It seems to prefer well-drained sites, but has often been recorded in valleys and along watercourses. Seeds are normally shed gregariously around mother trees, and they often germinate abundantly but soon die off. 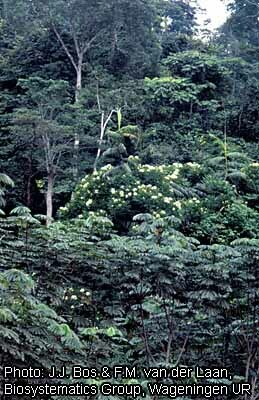 In Liberia it has been reported that saplings are most common in secondary forest close to mature forest. There are about 130 seeds per kg. Germination takes 8–21 days, and the germination rate is high. Larger trees are usually found scattered in the forest. In Gabon an average wood volume of 0.6 m³/ha has been recorded, but this may include also some other Berlinia spp. Trees normally sprout well from stumps. Berlinia confusa is widespread and although it usually occurs scattered in the forest and regenerates rather poorly, it does not seem to be threatened by genetic erosion at present. As is the case for many other Berlinia spp., little information is available on Berlinia confusa, especially concerning its growth rates, propagation and planting and suitable management measures. Research is needed to be able to determine possibilities for larger-scale commercial exploitation on a sustainable basis. However, the irregular shape of the bole is a serious drawback, which might be overcome by selecting superior tree types and developing proper methods of vegetative propagation. Obeng, E.A., 2011. Berlinia confusa Hoyle. [Internet] Record from PROTA4U. Lemmens, R.H.M.J., Louppe, D. & Oteng-Amoako, A.A. (Editors). PROTA (Plant Resources of Tropical Africa / Ressources végétales de l’Afrique tropicale), Wageningen, Netherlands. <http://www.prota4u.org/search.asp>. This page was last modified on 26 March 2017, at 12:49.